Pectus excavatum repair is surgery to correct pectus excavatum. This is a congenital (present at birth) deformity of the front of the chest wall that causes a sunken breastbone (sternum) and ribs. 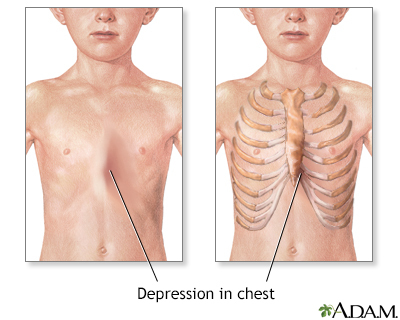 Pectus excavatum is also called funnel or sunken chest. It may worsen during the teen years. There are two types of surgery to repair this condition -- open surgery and closed (minimally invasive) surgery. Either surgery is done while the child is in a deep sleep and pain-free from general anesthesia. The surgeon makes a cut (incision) across the front part of the chest. The deformed cartilage is removed and the rib lining is left in place. This will allow the cartilage to grow back correctly. A cut is then made in the breastbone, which is moved to the correct location. The surgeon may use a metal strut (support piece) to hold the breastbone in this normal position until it heals. Healing takes 3 to 12 months. The surgeon may place a tube to drain fluids that build up in the area of repair. At the end of surgery, the incision is closed. The metal struts are removed in 6 to 12 months through a small cut in the skin under the arm. This procedure is usually done on an outpatient basis. The surgeon makes two small incisions, one on each side of the chest. A small video camera called a thoracoscope is placed through one of the incisions. This allows the surgeon to view inside the chest. 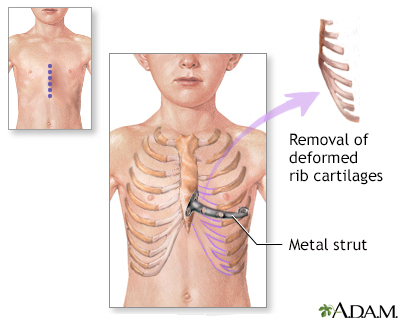 A curved steel bar that has been shaped to fit the child is inserted through the incisions and placed under the breastbone. The purpose of the bar is to lift the breastbone. The bar is left in place for at least 2 years. This helps the breastbone grow properly. At the end of surgery, the scope is removed and the incisions closed. Surgery may take 1 to 4 hours, depending on the procedure. 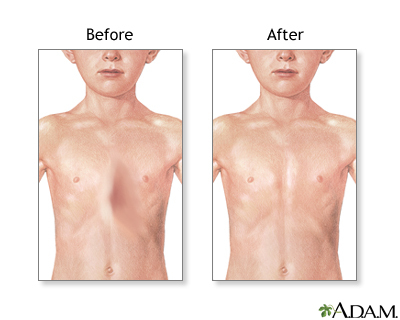 The most common reason for pectus excavatum repair is to improve the appearance of the chest wall. Sometimes the deformity is so severe that it causes chest pain and affects breathing, largely in adults. Surgery is mostly done on children who are 12 to 16 years old, but not before age 6. It can also be done on adults in their early 20s. Medicines your child is taking. Include drugs, herbs, vitamins, or any other supplements you bought without a prescription. Allergies your child may have to medicine, latex, tape, or skin cleanser. About 7 days before surgery, your child may be asked to stop taking aspirin, ibuprofen (Advil, Motrin), naproxen (Aleve, Naprosyn), warfarin (Coumadin), and any other blood thinning drugs. Ask your surgeon or nurse which drugs your child should still take on the day of surgery. Your child will likely be asked not to drink or eat anything after midnight the night before surgery. Give your child any drugs the surgeon told you to give with a small sip of water. The surgeon will make sure your child has no signs of illness before surgery. If your child is ill, the surgery may be postponed. It is common for children to stay in the hospital for 3 to 7 days. How long your child stays depends on how well the recovery is going. Pain is common after the surgery. For the first few days, your child may receive strong pain medicine in the vein (through an IV) or through a catheter placed in the spine (an epidural). After that, pain is usually managed with medicines taken by mouth. 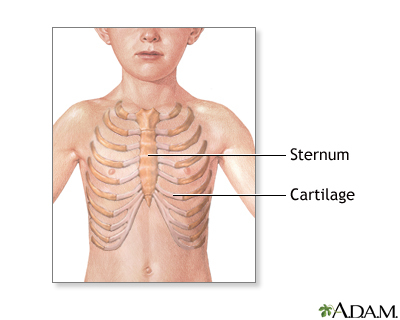 Your child may have tubes in the chest around the surgical cuts. These tubes drain extra fluid that collects from the procedure. The tubes will remain in place until they stop draining, usually after a few days. The tubes are then removed. The day after surgery, your child will be encouraged to sit up, take deep breaths, and get out of bed and walk. These activities will help healing. At first, your child will not be able to bend, twist, or roll from side to side. Activities will slowly be increased. When your child can walk without help, they are probably ready to go home. Before leaving the hospital, you will receive a prescription for pain medicine for your child. At home, follow any instructions for caring for your child. The surgery usually leads to improvements in appearance, breathing, and ability to exercise.